A horse quite unlike other horses was born. And before very long folks found out he was wacky! Meet Blackie, the stubbornly motionless equine hero of Christopher Cerf and Paige Peterson’s delightful and touching biography-in-verse, Blackie, The Horse Who Stood Still. See, most colts are frisky but Blackie was not. Blackie liked standing still! Yes, he liked it a lot! Standing here in the shade of a juniper tree….. This (mostly) true tale tells the heart-warming story of a horse who made standing stock-still a lifelong endeavor—while becoming a champion rodeo horse, a tourist favorite at Yosemite Park, a legendary environmental crusader, and the beloved mascot of one of America’s most beautiful towns, Tiburon, California, on the shores of San Francisco Bay. Standing still, like a rock, on the same patch of ground. Magically illustrated by Peterson’s lyrical paintings, Blackie is destined to become a children’s classic in the tradition of Munro Leaf’s Ferdinand the Bull and Dr. Seuss’s The Lorax, The playful, clever, rhyming text will charm adults and children alike as it delivers an important message about appreciating and preserving the natural beauty around us. Christopher Cerf is an author, composer-lyricist, record and television producer, editor, and cofounder and president of the educational television production company, Sirius Thinking, Ltd. Since its first season in 1970, Cerf has played a pivotal role in the creation and production of the "Sesame Street" television program, most notably as a regular contributor of music and lyrics. In the process, he has won two Grammy Awards and three Emmy Awards for songwriting and music production. Currently, Cerf serves as Co-Executive Producer of "Between the Lions," the multiple Emmy-award-winning children's literacy series, created by his company for PBS. Paige Peterson is a noted and widely exhibited artist who has been selected for membership in the prestigious Guild Hall Academy of the Arts in East Hampton, New York. As a child in Belvedere, California, she often fed Blackie apples, carrots, and sugar cubes in his pasture. She illustrated Jesse Kornbluth’s edition of “A Christmas Carol.” A Senior Vice President of the Huntsman Cancer Institute, Paige lives and works in New York City and Belvedere, California. "Blackie is the heroic antidote to our frenetic society, a guide to parents who often feel they must enrich and enhance their children’s development at every turn. Blackie stands still, knows the value of observation and reflection, of being in the world, not always acting upon it. Children innately know this, too. Parents, read with your children about this horse who will help you preserve in their up-bringing a necessary environment of calm." "Blackie is a beautiful and touching story, told in rhyme by Chris Cerf and Paige Peterson. Unforgettable as the tale is, the artwork by Ms. Peterson is even more so. Long after you've read the book, you will remember the stunning pictures, illustrating the events of Blackie's life. This book will be admired and enjoyed by adults and cherished by children. An instant classic!" 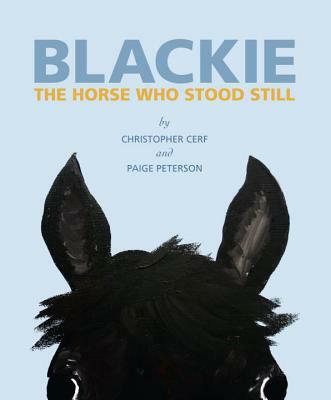 "If you're the horsey type, try Christopher Cerf and Paige Peterson's inspiring work Blackie: The Horse Who Stood Still. If you loved Ferdinand the Bull, then your kids will love Blackie." "In the season of long trips to Grandma's, new books with animal appeal are perfect for taming the young folk. Inspired by a lovably balky horse who was the pride of Tiburon, California, this sweet picture book depicts stubbornness as a virtue." "For a story about a horse that stands still, Blackie is wonderfully moving! It's a heartwarming reminder -- to children and adults alike -- about the preciousness of patience, dependability and love. Christopher Cerf's wordplay is mischievous and delightful, and Paige Peterson's paintings are simply breathtaking. I love this book!" "Oh, Blackie, my hero. You truly can stand put in afast-moving world and still succeed. Thank you, Paige, for your tender illustrations, and Chris, for such inspiring words. This tale will be told to my grandchildren over and over." "Blackie is a must for every family bookshelf. The endearing and evocative prose by Christopher Cerf coupled with the colorful, innovative, and unforgettable illustrations by Paige Peterson make for an enchanting literary experience....A delight for the young at heart of all ages....You'll love it!" "When we bought our very first home, in Tiburon, California, we didn't realise we'd be living across the street from a celebrity, 'Blackie. This charming book brought back wonderful memories of him standing as a living landmark in his pasture - a beacon signifying HOME - every day for our family. Can't wait to share it with our grown 'kids' and our nine grandchildren, too. What a lovely and touching gift 'Blackie' will be for all of us!!!" "Paige Peterson's paintings remind me of the joy of art. She has a wonderful sense of color and a unique vision." "Illustrator Paige Peterson and Sesame Street co-creator Christopher Cerf have a message for overscheduled children: Slow down. They've created a beautiful new book." "What a sweet, soulful tome of tree flesh. Cerf's Up! Turn the page!" "BLACKIE is an equine delight...the story and the illustrations are witty, deceptively simple & simply beautiful." I wish our daughter still nestled in my lap so I could read her the inspiring story of Blackie, a horse who appeared lazy but in fact understood why nature is to be savored and change is sometimes to be resisted. I think I'll read it to her anyway! "Growing up on the Tiburon peninsula, Blackie the horse was part of my community. In their delightful book, Christopher Cerf and Paige Peterson not only recreate the true story of an amazing animal, they capture the magic that every child felt seeing Blackie's stoic silhouette in the pasture. It's a wonderful story about a special horse that helped define a community." "This charming and sweet tale celebrates the life lived with deliberate tranquility -- a life that resists the enticements of bustle and business. Blackie reinforces simple and powerful values in a book that is deepened and enriched with its marvelous illustrations. Children of many ages will be drawn to this delightful story." "What an absolutely charming yet powerful story! The cleaver rhymes and striking simplicity of the illustrations are in perfect harmony...hard to imagine what came first as each beautifully compliments the other. A brilliant little book that elegantly honors a horse who every reader will empathize with." "Blackie is such a perfect interweaving of Cerf's warm, unfussy lyricism and Peterson's simple, elegant, deep-and-wide paintings - the warm narrative playing lightly against a backdrop of bold colors and unexpected compositions of ears and eyes, shoes and sky. A totally charming naivete pervades the sweetness of the storytelling." -Fred Newman, Actor, "A Prairie Home Companion"
"I can't wait to read this book to my children. It's wonderfully heart-warming and lyrical, a beautifully rendered and lovingly told story for those of us not resigned to following the pack! Bravo!" "Blackie represents a wonderful coming together of Chris Cerf's lilting rhythm and rhyme and Paige Peterson's charming and touching illustrations. This tale should appeal to people of all ages, and reminds us once again that time passes so fast that we must force ourselves to slow down and smell the roses when we can. Blackie is a winner." "With Blackie, Chris Cerf and Paige Peterson have written a beautiful book that brings a smile to my face and a tear to my eye. And make no mistake, while it has the look of a children's book, its message is right for all ages. I highly recommend Blackie for young and old alike." "A charming children’s book that can teach us all about the delight of simply standing still." "A great artist it seems to me captures not just a subject but a particularly telling moment in the subject's life. As Picasso said, 'I paint to find out what I think.' Discovering what Paige Peterson thinks is always interesting indeed." "Paige Peterson and Chris Cerf have created a heartfelt classic illustrated story about a real life horse Blackie and his lifelong career of standing still. But it is so much more than that. In its sophistication, Blackie cannot be classified as strictly a children’s book. It is funny, it is goofy, it is intelligent and entertaining and it had me in tears. The rhyming text by Cerf and Peterson and the quirky paintings by Petersen combine to create a well spun tale that appeals to all ages can and starts a conversation about commitment and convictions in a manner that kids can understand and any parent would enjoy having with their children." "I loved the book and plan to incorporate it into my lectures as a symbol of standing still and not trying to make things happen. The illustrations are spectacular–simple, clean, but evocative." "The spirit of BLACKIE is forever summoned through the magical words of Christopher Cerf and enchanting illustrations of Paige Peterson." "It is amazing that someone as active as Paige Peterson can so ably depict the virtues of standing still. She is without question a multi-faceted and multi-talented person. Her sweet illustrations are a pleasing complement to Chris Cerf’s presentation of a simple but meaningful story. What many readers of Blackie: The Horse Who Stood Still may not know is that our energetic Paige is always moving in pursuit of support for the Huntsman Cancer Foundation. To put it simply and meaningfully, we are in awe of her talents and creativity."